Learn more about how helicopters benefit can the utility industry in Delaware. Delaware Transmission Line Construction. Efficient and Safe Helicopter Services. Delaware Transmission Line Construction or repair presents a myriad of logistical challenges depending upon the specific job. A helicopter lift can overcome them all in a safe, effective and efficient way. Powerful enough to lift, haul and place large utility towers and agile enough to string the wire, helicopters lifts can provide a key advantage to any municipality, utility company or contractor. At FairLifts, we work with a worldwide network of partners and can quickly match up your job with the perfect helicopter and experienced pilots needed for this line of work. Contact our experts about your transmission line job and see how many ways a helicopter lift can help. Although the second smallest state in the country, Delaware presents big challenges for any construction project, specifically transmission line construction and repair. With much of the eastern portion of the state bumping against the Atlantic Ocean and dotted with numerous islands, bays, swamps, tidal creeks and swamplands, environmental issues are nearly everywhere. Helicopter lifts offer a perfect solution, often completely eliminating environmental concerns as these machines can easily access wetlands areas ground equipment cannot. Helicopters can also transport crews and equipment, haul and place towers, string wires and more, and they don’t need a road to do it. Similarly, helicopters can be effective solutions to interior projects as well. Got questions? Give our experts a call. FairLifts agents can easily reserve Delaware transmission line construction services as a result of an extensive network of experienced and professional operators. Booking through FairLifts delivers personal access to the agent's expertise in sourcing an ideal operator, aircraft, and hardware to get the project done according to your specifications. Read on to learn more. 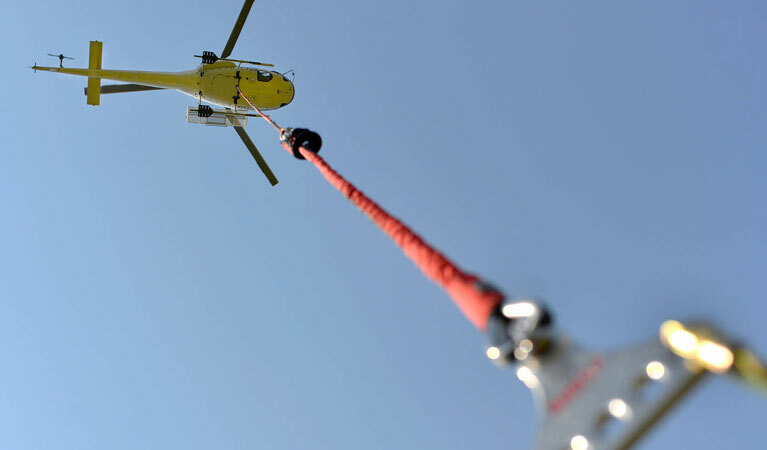 Equipped with an external utility hook and line, helicopter lifts are capable of hauling massive loads, which is helpful in supply and equipment delivery situations. Get needed supplies to any location quickly and effectively. External hauling can also be useful when doing site-clearing. Alleviate the need for bucket trucks and make cross-country (or water) wire-stringing a breeze with a helicopter lift. Able to cover large areas, regardless of the terrain, helicopters are often the best (and sometimes the only) practical solution to utility transmission jobs. Decrease transmission pole installation times with a helicopter lift. Able to haul the pole to the site (if needed) and place it into position, a helicopter lift can greatly increase installation efficiency and bypass any site-access, environmental, or right-of-way issues. Often a challenging aspect of transmission line construction, site inspection is made simple with a helicopter. Able to cover large distances - and fly over right-of-way issues - without ground infrastructure support, carry cameras, video equipment and personnel, helicopters make site inspections fast, effective and environmentally friendly. Helicopters make logistical nightmares disappear. With the ability to perform a variety of inspections, bring crews, equipment or supplies directly to any site, helicopters can make repairs, inspections, and maintenance simple and efficient. Get support and supplies where they need to be quickly and safely. Experts are standing by to get you a fast quote for your transmission line job in Delaware! FairLifts agents are available 24/7 to provide you with information regarding all of the utility installation services at your disposal via local operators. From Delaware transmission line construction to the simple movement of personnel to remote or offshore locations, we can coordinate your project's helicopter applications from start to fruition. Call us any time. We’re here to assist you.